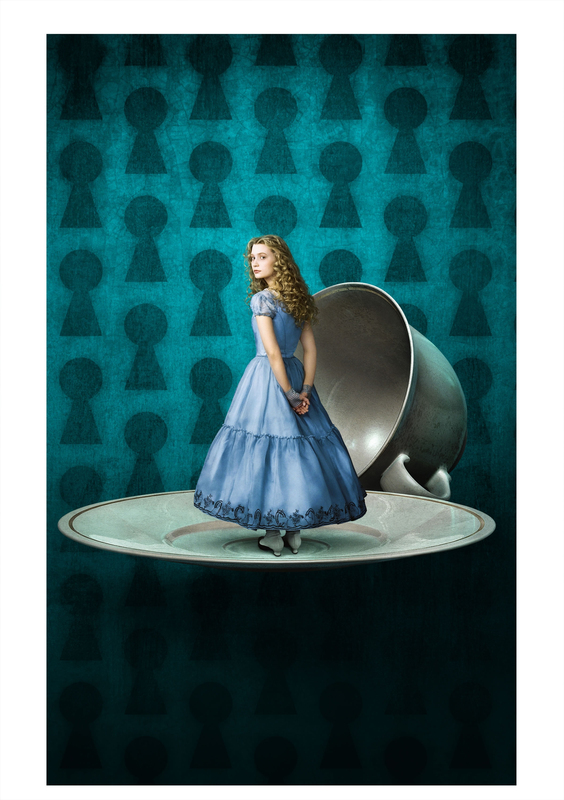 This costume, which I will dub the "Down The Rabbithole" dress until it gets named, is worn by the character Alice Kingsley in Tim Burton's "Alice in Wonderland". I plan to make this costume in 2010 and plan to wear it to DragonCon 2011. 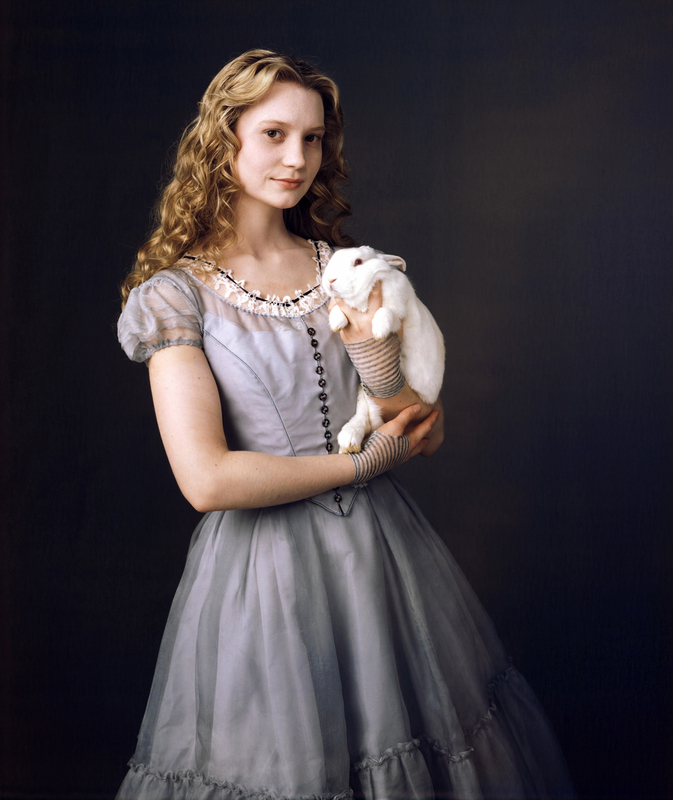 I am not working on this dress yet, but am assembling my research here. Please feel free to use it! If you make your own dress, I would love to see it! -edit- I am actively working on this dress now. I am blogging most of my information while I'm making it on a livejournal page I've made, which you may feel free to follow. My Observations - Based on all of the reference images I've seen so far of the costume, these are my observations, and may or may not be accurate. This dress has two layers to it. The underlayer appears to be white silk satin. 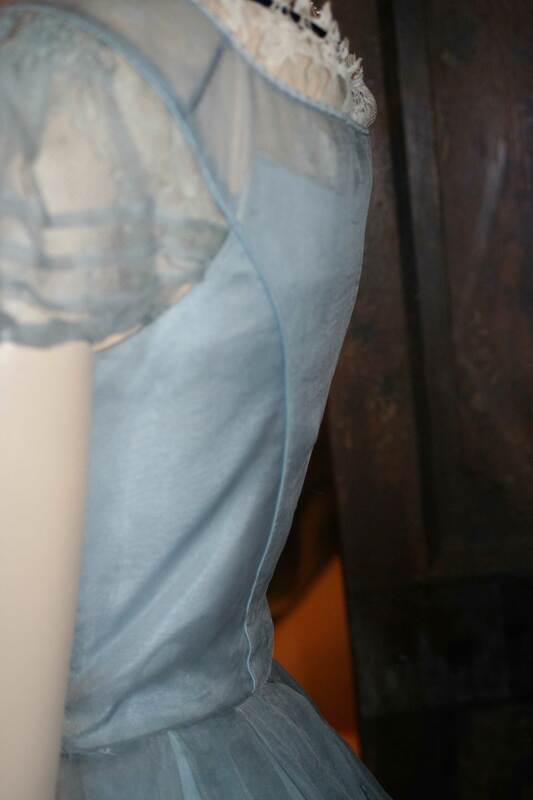 The outer layer appears to be silk organza, and is dyed the palest shade of pastel blue. The white underskirt appears to be one part, and circular. The outerskirt is in two parts, tiered. It is somehow finished where the seam is on the outside. Possibly roll-edge-hemmed with the seam outside? The bottom part should be rectangular, roll-edge hemmed on bottom and gathered into the skirt. I am not positive if the top of the blue skirt is curved or rectangular, but it is gathered, probably randomly pleated into a waistband. The back of the skirt *may* be attached to the bodice, but from overlap I think there's a waistband and closure slit(s) underneath bodice front. 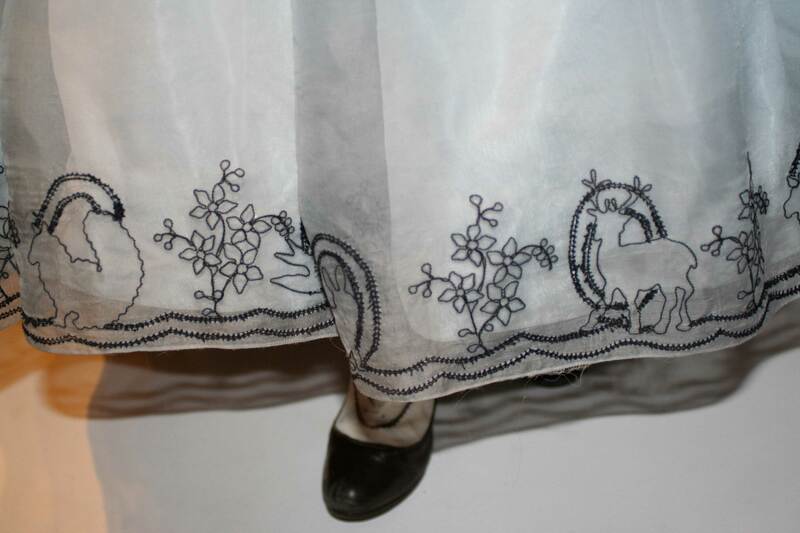 The bottom of the skirt is embroidered in black with animals and flowers, and the order is, what I think is a Squirrel, Flowers, Birds, Flowers, Rabbit, Flowers, Deer, Flowers. Repeat. I am not sure yet how many repeats there are until I see more reference pictures, but I would guess 6-8 at this point. 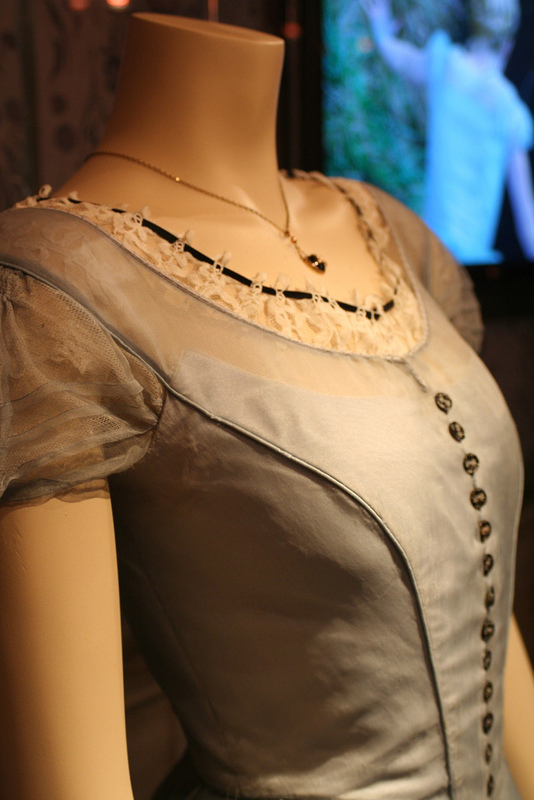 The sleeves and neckline behind the sheer is lined with a white netting (possibly the same as the gloves.) This netting is similar to the lace on the collar and possibly the lace is made from pieces of lace cut out and sewn onto the netting. 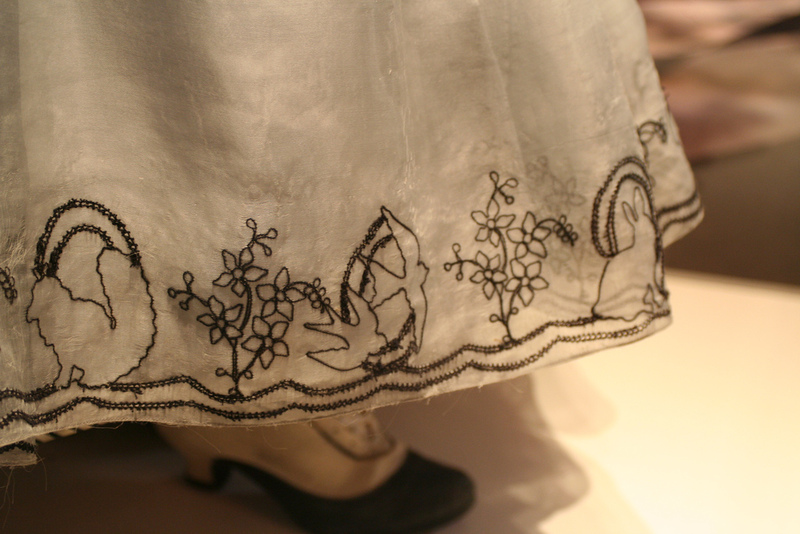 There is black ribbon threaded through the top of the lace to gather it. 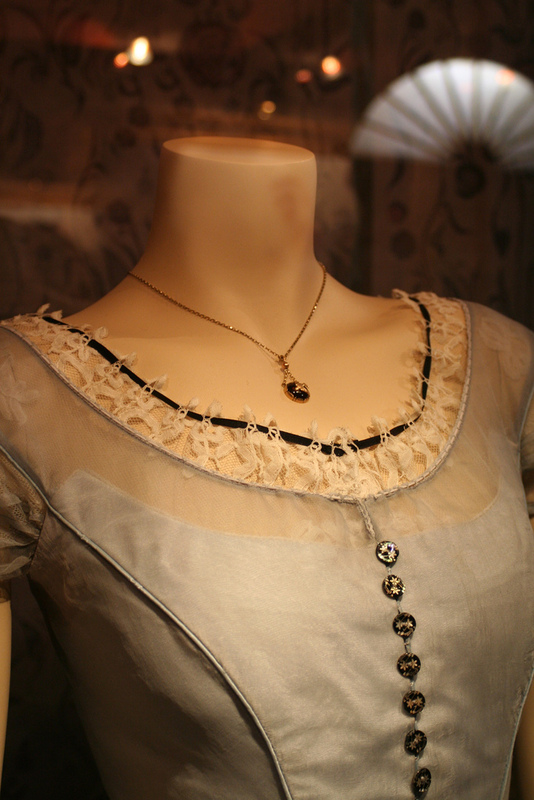 The collar has a second layer of trimming close to the neck. 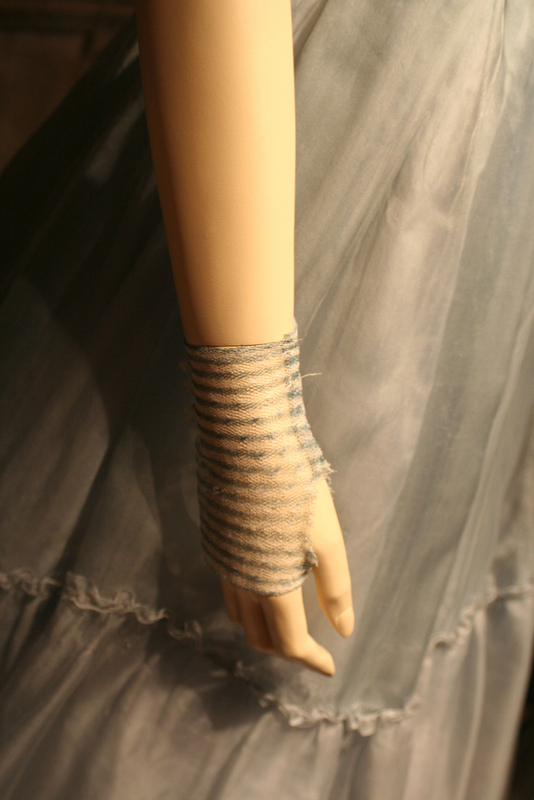 It is a simple open loop in pale blue, with a matching cording run through it. 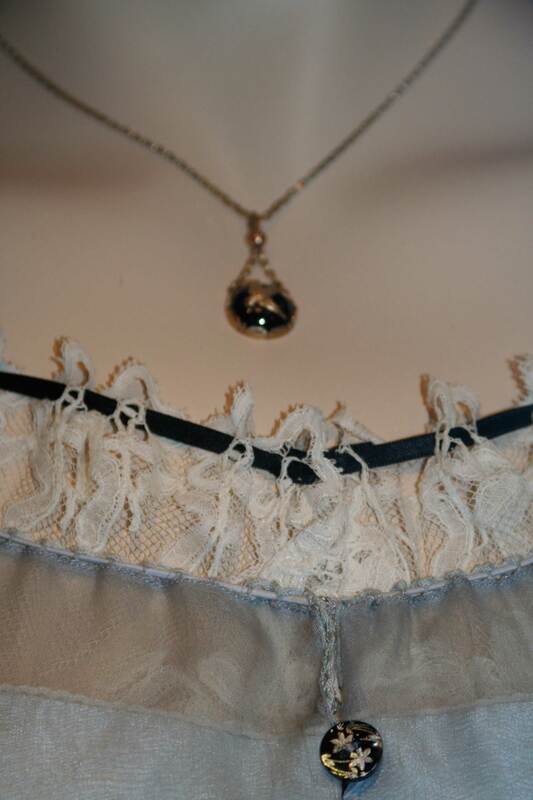 This goes on top of the lace along the neckline and down the opening where the sheer is. 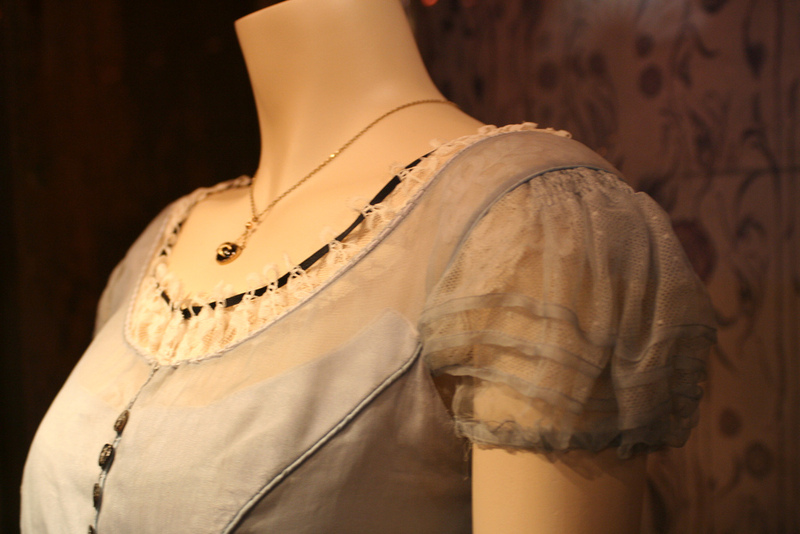 The sleeves have three tucks along the bottom and either a 4th or a velvet ribbon at the bottom. There is controlled gathering, possibly cartridge pleating at the top. 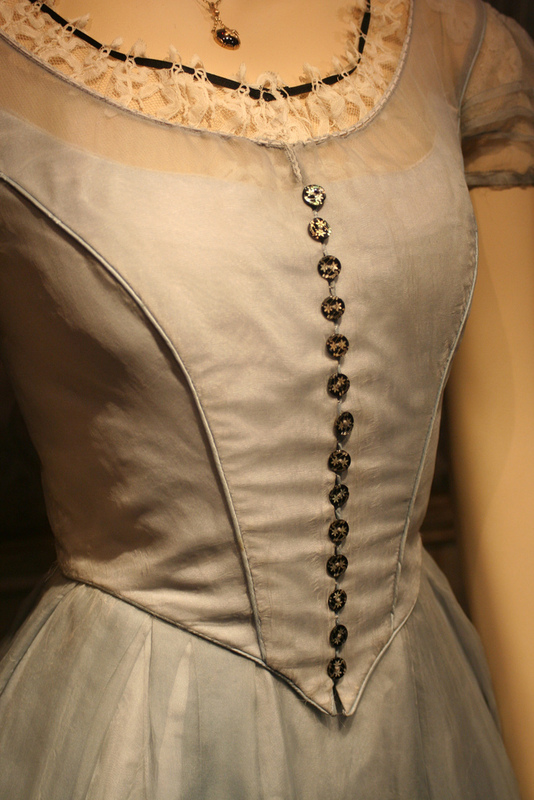 The bodice consists of 7 pieces, 3 in back, 4 in front, and princess seams to the armscye. The white underlayer (probably lined for smoothness and body) does not go all the way up. The actual buttons used have been found at HushcoButtons.com and are number 493802. I am guessing they are size 18L, based on I believe I am the same size as the actress, and I've compared 14 1/2" buttons (these are slightly less than 1/2") and 5/8", and the 18L look more correct. I've ordered buttons from them, I am not sure if they do retail. They were .50c apiece with a minimum order of 12. 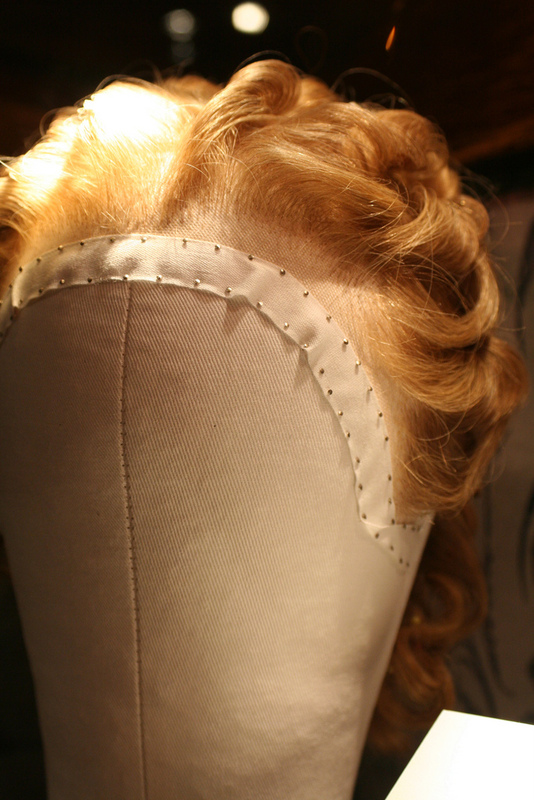 The bodice is piped on the front princess seams and it appears to continue around the armhole stopping where the white bodice starts on the back. It's blue, but I'm not sure if it's satin dyed that color or the organza over white satin sewn into piping. 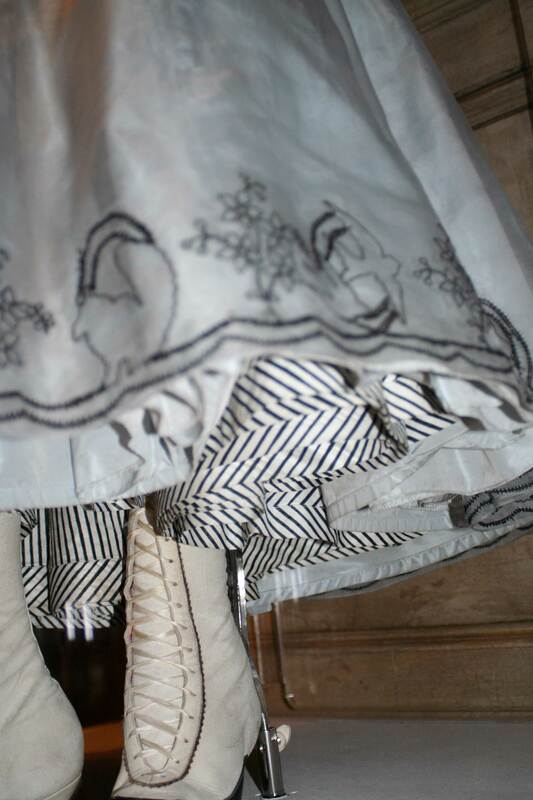 There is a petticoat, circular, underneath made of a fine navy-and-white striped silk or acetate lining. I am not positive if this is the only petticoat or if there's tulle attached to the petticoat for extra floof. The actual dress looks less poofy than the promo pic. Her gloves are not quite gloves; there's no separate fingerholes, it almost appears to be just netting, sewn to cover the hand, a hole made unfinished for the thumb... it almost appears as if someone took a blue marker and drew the lines on neatly on top of the netting. 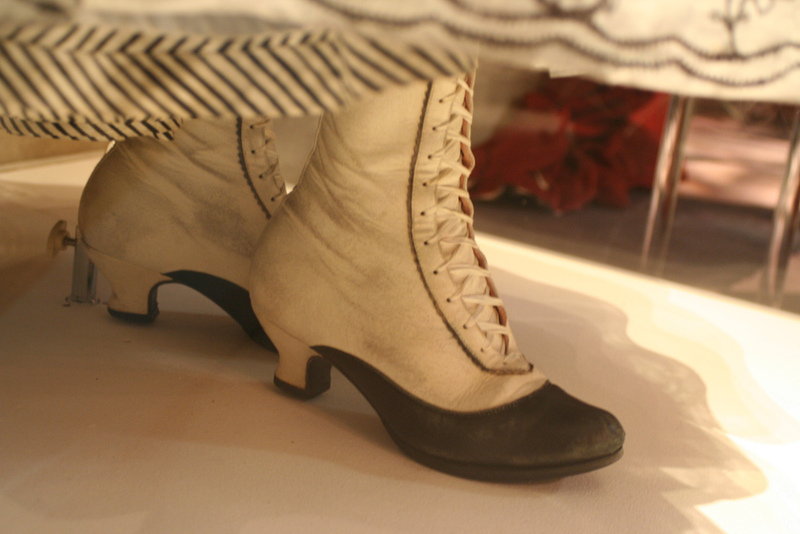 Her boots are white victorian leather books with a black sole and black tips. There's a fine black scallop trim outside of the laces. The only accessory she seems to have is a necklace on a gold chain. The gem is set in a gold (or yellow metal) setting, with an image of a swallow or some type of bird on top. It appears black, but on one of the pictures I see a red shine, so I think it's a garnet. I am hoping that after the movie comes out, someone like the Noble Collection will come out with a replica. All of these images belong to FrockTalk.com. I apologize if it's not cool to post these here, but I couldn't find an email to ask permission! If you take these, you MUST credit them to the original source!